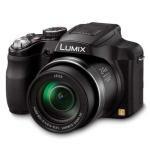 Panasonic Lumix DMC-FZ60 Expert Reviews - Read Reviews and Buy Smarter Online. Verdict: With a variety of creative controls and manual controls, it's hard to ignore the power of the Panasonic Lumix FZ60. Verdict: Both get a pop-up flash and Intelligent Zoom, which uses digital zoom to reach up to 48x (although it "results in a grainy image which lacks detail," says Nuttall at WhatDigitalCamera.com). And both get the same plethora of photo styles (vivid, monochrome, etc. Verdict: This 16 megapixel "bridge" camera has a 25–600mm Leica-branded lens with f2.8–5.2 aperture. It is fitted with an electronic viewfinder and a fixed position LCD. The lens is image stabilised, as it needs to be with such extreme telephoto extension. Verdict: Price: $600 The evolution continues THE LOW-DOWN This 16-megapixel ''bridge'' camera has a 25mm-600mm Leica-branded lens with f2.8-f5.2 aperture. It is fitted with an electronic viewfinder and a fixed-position LCD. Verdict: Steve's SnapShot Cons Bottom Line Pick This Up If... You can check out the price of this camera on Adorama by clicking here . Verdict: The Panasonic FZ60 (known as the FZ62 in Europe, hence the branding in our photos from Photokina) is a 24x superzoom with a 16.1-megapixel CMOS sensor. It's one of three full-size superzooms in Panny's current lineup, sitting behind the $600 FZ200 and ahead of the LZ20 budget model. Verdict: I have had this camera for some time now, and I love it! Easy to use, lightweight, and super optical zoom. I have had many Panasonic Lumix models and loved them all. I will stay with this one for a long time I know. Verdict: This camera gives us so many improvements in quality, useability and features over the point-and-shoot cameras we've owned (3) at a price that is astonishing. WE could not imagine being more thrilled with our purchase. Verdict: Beware. As quoted in review above, its not f/2.8 throught out the range fz200 model has that feature, and its fz60. Possiblly the reviewer has confused b/w these two models i guess. Verdict: I have not used the camera a lot as yet and mostly on the auto setting but find both the macro & zoom features very good compared to my previous camera. Verdict: Used for family portraits. Auto focus worked very well taking pictures during a wedding. Bride and attendants walking down isle were very clear. Pics at reception (low light in room) looked great even without a flash. Verdict: I love this camera, especially for the value of all its capabilities. The FZ60 is almost perfect camera.The only important component that is missing is the capability to use a cable or wireless shutter release for night photography.